The designer and his wife have built the award winning kit plane Glasair I RG 'The Pink Baron' in Switzerland in the time from April 1987 until October 1989 accumulating 4000 hours. Jurg Sommerauer, together with a friend, has then flown the airplane in August 1991 from Zuerich, Switzerland to Ogden, Utah. Thereafter the Pink Baron was frequently part of the static display at Oshkosh, Sun 'n Fun, Arlington, Phoenix 500, and many other air shows and fly-ins throughout the USA. The designer was in charge as project director for R & D, developing a low cost aerial multi-purpose sensor platform based on an existing advanced motor glider, Stemme S-10. The prototype was displayed at the air show 1989 in Le Bourget, and an article was published in the German aviation magazine 'Aerocurier' by the German test pilot Dieter Thomas, as shown below. The platform was intended to be setup for realtime IR remote sensing, remote chemical monitoring, photographic imagery, for which dedicated underwing pods were designed. The airplane was able to loiter for more than 12 hours, over noise sensitive areas at low or high altitude depending on the specific mission. Applications: Forest fireprevention, Energy loss monitoring of buildings, drug intercepting, just to mention a few. 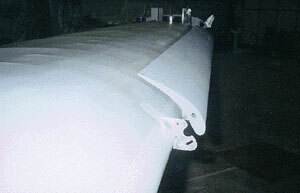 The designer was contracted by a Swiss Aerospace company in November 1992, to develop and construct a prototype wing for a test bed with a required stall speed of only 19 mph, with a low weight. 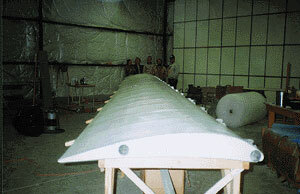 wing weight was below 125 lb. The project was successfully accomplished April 1993. Copyright © 1995-2018 AVI, Inc. All rights reserved.